With the onset of HTML5, there is a dramatic paradigm shift in the wake for online media content delivery. For well over 6 years, this industry has been dominated by the proprietary Adobe Flash Player, which has been used to deliver high quality media to audiences far and wide. This reign is coming to a dramatic end as new Open Standard technology takes its place. Yes, HTML5 is here, and we present to you the Open Standard Media (OSM) Player! The Open Standard Media (OSM) Player is an all-in-one media player for the web. It is an industry changing, open source (MIT) media player that is written in jQuery to dynamically deliver any type of web media, including HTML5, YouTube, Vimeo, and Flash. The mediafront module is a front end media solution for Drupal. It employs an innovative and intuitive administration interface that allows the website administrator to completely customize the front end media experience for their users without writing any code. In addition to this amazing module, we would also like to introduce the Open Standard Media Player. This media player is an industry changing, open source (MIT) media player written in jQuery to dynamically deliver any type of web media, including HTML5, YouTube, Vimeo, and Flash. The Dash media player module is a module used to integrate the Dash Media Player into the Drupal Content Management System. This module is used for Drupal 5 and Drupal 6. 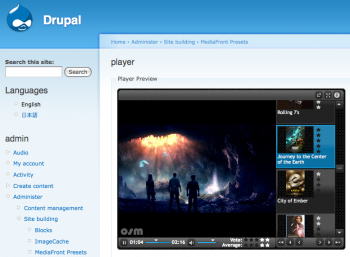 For Drupal 7, the MediaFront module will be used to implement the Dash Media Player. For that reason, this module will only be supported in Drupal 5 and Drupal 6. 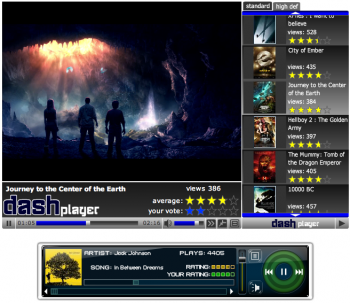 The Dash Media Player is a revolutionary, first of its kind, free to use media player built specifically for Drupal CMS but also works as a direct replacement for other popular media players used today! 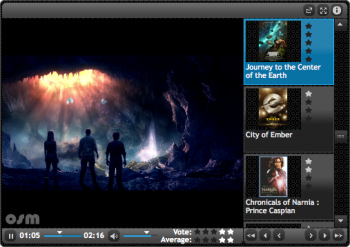 Just imagine, a media player whose content is driven by the power and flexibility of a content management system. With this player, you can truly take advantage of the best of two worlds... the incredible user interface of Flash, and the unparalleled content management of Drupal.